Raised and educated in Puerto Rico, Millie Torres brings the colors and intensity of the tropics and her Hispanic roots to paintings of gardens, seascapes, flowers and portraits on display at the gallery in A Candle in the Night, stop 14 of this month's Gallery Walk. This retrospective exhibit includes Torres' drawings of flowers and landscapes, a number of them started while traveling in Sweden, England and Ireland, where she found her surroundings particularly inspirational. Torres finds that painting is a way to take the beauty of what she sees with her, whether it is a landscape or a portrait. "It is like being in love," she says. "There is an excitement, a happiness you feel when you paint. I have goose bumps when I can capture what I'm seeing. It makes me more alert to beauty," Torres explains of her work mainly in watercolors, oils, and acrylic. For example, "Cleaning the Pond" is an impressionistic celebration of blue and multihued greens, of light's reflections in the lily-filled water. You can almost feel the heat, sense the sweat on the brow of the anonymous boaters, hear the hum of the insects and the languid dip of the oars making their way across the top of the canvas. "Millie works a lot on her colors," says Ric Campman, one of her teachers at the River Gallery School in Brattleboro. "Some of her gifts come naturally, such as likeness and proportion, but she really works at her colors, and it pays off. She'll change a whole painting to get a color right," he attests. 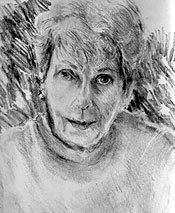 Pen and pencil on drawing paper, 5"x16"
Working for 40 years as a legal secretary in San Juan, the capital of Puerto Rico, Torres initially was what she describes as "only a weekend painter." Joining her daughter in Brattleboro, Vermont in 1998, Torres has focused her later years on her art with tremendous dedication and intensity. She is experimental in her approach, always discovering what she wants to paint from a scene, using her drawings as the genesis of her paintings and often representing the same subject matter with a variety of media. "Millie looks hard at her pictures and questions them," says Campman. "That in itself is a gift. She's very self-critical, but it also serves her." Her self-portraits manifest a woman getting on in years, with piercing eyes confronting the viewer. "She never wanted to paint herself as pretty," recalls teacher and mentor Ric Campman. "She wants the rougher parts of her personality to be exposed, something most people move to conceal in self-portraits," he admits. "All Millie's portraits are very penetrating, filled with a real depth of insight." Torres initially studied studio art at the Escuela de Artes Plasticas in Puerto Rico, then with Charles Movalli in Massachusetts, and as a visiting student at the Vermont Studio Center in Johnson, Vermont, from a week to a month at a time for four sessions. In Brattleboro she has seen her art blossom in new directions; for example, undertaking a series of portraits of Mr. Andrew Lehrman of Zephyr Designs, the first person who challenged her to paint a portrait. In "Andrew Standing, Leaning on Chair," one of her latest portraits, Andrew stands in frank assessment of the viewer, with lips pursed and his gaze solemn. With a warming background of terracotta and ochre, there are few distracting details to take the viewer's eyes from the subject's stare. Torres captures the gentleness of her subject in his slender frame bathed in whites. Torres has taken studio painting from Ric Campman at the River Gallery School for four years and recently completed a figure drawing class with Lydia Thomson. She has exhibited in several group shows in Brattleboro gallery spaces, and her paintings are in private collections in New England and Puerto Rico. Torres has titled the show "Seventy-Eight and Still Painting," as she hopes to inspire everyone, no matter what their age, to experience the joys and struggles of expressing themselves through art. "Many people my age are sitting inside watching television," she says. "I wish I could encourage them to paint. There is no age limit to making art." "She is not locked into one way of doing her art," says another of her teachers, Lydia Thomson. "Millie's always exploring, she's alive to possibilities, always trying to find new ways to look at things. She approaches he art with a very young spirit." Millie Torres: Seventy-Eight and Still Painting runs October 3-31 at A Candle in the Night, 181 Main St., 802-257-0451.